Most writers write to get read, so how do readers discover ebooks? To discover clues to the answer, I posted a survey over at Mobileread, the online forum popular with many ebook readers. I challenged readers to select the single most common criterion they follow to discover their next read. The results provide some interesting data points Smashwords authors and publishers might consider in their marketing efforts. To capture a broad range of usable data, I suggested 12 answers, one of which was "Other." Respondents were allowed to select one answer only since I wanted to identify the single most important discovery criteria. As of this writing, 206 people answered the survey. Click the image to enlarge it. 1. The most-selected answer was "Recommendations from fellow readers on online message forums, blogs and message boards," with 29% of respondents choosing this. By contrast, only 4% selected, "Personal friend/family member recommends it to me." I think this is fascinating, because it implies readers might trust the collective wisdom of strangers and online acquaintances more than they trust the recommendations of immediate friends and family. At the risk of placing too many eggs in this basket, remember 71% selected something else. 2. The second most common answer was, "I look first for my favorite authors," coming in at 18%. This makes sense. As I mention when I present my Seven Secrets to Ebook Publishing Success talk, the author is the brand and if the author can earn the trust and loyalty of readers, readers will return to that brand for their next read. Readers in this group may also be more risk-averse. One respondent commented, "I'm at a point in life where I mostly stick with authors I already know and like. Why waste time and money on something I may not like?" 3. I found it interesting that the top two answers accounted for 47% of responses, with the other 53% of answers fragmented across ten other answers. This implies, I think, that in order for authors to reach the maximum number of readers, it requires them to orchestrate multiple touch points. 4. Several answers indicate buyers prefer a random discovery approach. Readers like to browse. Taken in the aggregate, random browsing rivals the single largest discovery method, with over 25% of respondents. The following are all random browsing methods: I browse book covers, and if it grabs me I investigate further (7%); I browse randomly then look at reviews (7%); I read free ebooks, and if I like the authors I buy their other titles (5%); I browse paper books at brick and mortar bookstores, then search for the ebook online (4%); I'll sample anything, and if it grabs me I'll download/buy it (4%). Most other answers involve some element of random browsing. 5. The Mobileread community has apparently abandoned traditional print media as their first choice for reviews and recommendations, with only 3% citing this as their preferred book discovery method. This isn't surprising, considering Mobileread is a hyper-focused community dedicated to e-reading. It's not representative of the entire population of book buyers. However, I think Mobileread does serve as a leading indicator of how consumer sentiment will change once readers make the transition to e-reading. Looking at the answers in aggregate, it's clear that over 90% of ebook discovery is occurring in the online realm. 6. I was surprised only 3% of respondents looked first to the bestseller lists, which scored just as poorly as print media reviews. Possibly it's a flaw in how I structured the survey. I was also surprised that retailer recommendations, such as the "people who bought this bought that," scored only 5%. Maybe if I asked, "Name the top three methods you use for discovery," these would have scored higher. 7. The "Other" answers, where I invited Mobilereaders to leave comments and elaborate, elicited 11% of responses. Judging from their comments, several of them found it difficult to choose a single favorite discovery method (in other words, they didn't follow the survey instructions which asked them to choose their #1). Of those who provided true "other" answers, several mentioned they discover books at libraries, or select primarily by title or book description (I should have included these as a survey options). Do the findings above match your experience as a reader or author? This is great info- thanks Mark! I am surprised though that so many readers cited getting recs from on-line sources rather than personal ones. I rely on friends recs - whether in person or over Facebook - first and then turn to tools like GoodReads. author, All Good Things Die in L.A.
As a writer, this is wonderful information to have. Thanks for the survey. Hi Anhoni, I thought that was surprising as well. It indicates some readers feel strong affinity and trust for their online tribes of fellow readers. The power of loose connections. The data is probably skewed somewhat since I ran the survey in an online community. So the question the becomes: where are the good online communities where people are talking about books (and eBooks specifically)? Thatcher, I mention several in the Marketing Guide. Most of the ebook retailers operate online forums (Apple, B&N, Amazon, and then there's Kindleboards, Nookboards, (don't forget Mobileread), and online book communities like Goodreads, LibraryThing and Shelfari. Google any topic, genre or theme along with the words "message board" or "forum" and you'll likely find myriad additional communities. Would love to see other authors post their favorites here! Thanks for sharing this information, Mark, as well as your observations. It's very interesting and helpful to see this kind of data. Extremely interesting survey, well done (and well analyzed) thanks! If it's true that such a small amount of people are influenced by the printed media recs, this is devastating for the NYTimes and others who are similar! Of course, you surveyed a very special crowd, the tip of the iceberg that is already out basking in the digital world and rarely plunges down into the printed world, if at all. Publishers really should do a similar survey. But I hear of very few, if any. Can you suggest any to look up? As to marketing strategies, I was recently struck by John Locke's savvy use of "loyalty transfer", a new and very clever (if somewhat manipulating)strategy. I would add that to your list of suggestions! The alternative explanation is extreme selection bias given where the survey was posted. Most sales data seems to suggest that position in a best-seller list matters greatly when it comes to mass consumer behaviour. Most editors from my old NY-pubbed days told me nothing was a better sales tool than word of mouth, which is what we're talking about here. The technology may have changed but that's that's basically what the majority of the respondents are saying. Thanks for the info, Mark! I find this survey interesting for another reason...it really reinforces why there's such an argument among writers about which marketing approach works best. The truth looks like if you work hard in a few areas, you get a good chunk of the readers' attentions. This is the market research writers have been waiting for. There is so much worry and speculation about how to get hold of writers. Great post, I'll share it ... lots. Fascinating and thanks for doing this. We always knew word of mouth was key. However, as anecdata, I find placement still rules. For example, my latest release was featured on a blog on the Nook web site. It shot to #2 overall within two days, just behind The Help and ahead of Patterson's latest. A week or two later, a computer glitch made a series of my books 'disappear' from the Nook web site. All 7 books had been in the top 100 in science fiction including one in the top ten for months on end. That 24 hour glitch cost dearly and we still haven't recovered from it. Sales plummeted from hundreds a day to about 10. We're slowly rebuilding those sales, but it really points to me that placement on those top lists are where a lot of browsing readers find books. I wonder if there isn't a disconnect between what readers say they do (when forced to think about buying patterns) and what they really do when they're just browsing. Mark, excellent survey. Thank you for the information. As a writer of non-fiction, I am actually heartened by the fact that readers are looking to forums, blogs, and other online sources for inspiration and recommendations. My friends and family frankly couldn't care less about my cycling books. They think it is "neat" but they are not advocates or referrals spreading the word. I have found the most success in quietly marketing my books through value-added involvement in the reader communities through on-line forums. I try to provide useful feedback and recommendations. Potential readers might see that as informative and take the step to check out my book. Excellent survey, Mark. Thanks for the information. It can be most helpful for authors, new and old. Mark, you have done it again. I know you are a mindreader. The question of 90% of the indie writers is where do I get the most bag? cover? samples? social nets? I'm begining to beliee that readers look to Twitter (#amwriting, #publish) etc for recomendations. I do. I also wonder at the statement by B&N that romance is the highest volume market. Looking at some of the online today you would think that would be vampires and erotica. Did you allow for multiple answers from the same reader? I know that personally, I select ebooks for a variety of reasons... no one reason really sticks out more than another. I buy books by authors I already know, from authors that I've read their free content and decided to buy other books by them, by recommendations, etc. This is very interesting and helpful!! thanks for crunching the numbers on this!! A lot of the sites mentioned have opportunities to get to potential readers but self pubbers have to be careful not to shamelessly self promote. The trick is to build relationships and take part in the discussions. Great info. Thanks! I've discovered that the hardest part of being a sci-fi/fantasy writer is getting people to read and comment on my books. You've provided tips here that may help me do that. Interesting results, and so informative. One quick question, I'm assuming that the respondents were answering in relation to their ereader book purchases, correct? .. superb info, liked the way you discussed the findings - pointed out areas of note and also pointed out potential weaknesses in survey questions... i was blown away that recommendations by friends/family came in low... this is a BIG help for me as a prep my 1st novel for publ. I was not surprised by the second most common answer of readers finding their favourite authors first at 18 percent. It just makes sense to go with what you know. What did surprise me was the measly 3 percent that checked out the best seller list for books. I find that hard to believe, since I had experience with a free book going to number 3 and downloading as much as 1000 downloads a day. Of course this was free and probably not a true picture of what a best seller book that was not free might download in a day. I also came away with the same belief I have always had that readers like a well known name and are comfortable with the tried and true. The percentage of adventurous readers who try new stuff are less of course, and that is to be expected since buying books cost money and they want some kind of insurance that they are going to be satisfied. Of course Amazon will refund any book so a reader can take a chance there. Don’t like it, return it. I don’t like that policy really. Since most e books are not expensive, there really shouldn’t have to be a guarantee that you can return something after you have read it and didn’t like it. You certainly can’t do that with a print book. (Maybe you can on Amazon, I don’t really know, but not in a book store. Many helpful folks there and books are discussed as well. I really like that one. I have to agree with Bob - I think bestseller list placement (and also boughts, especially on Amazon) is huge. I'm not saying the survey data is wrong - just that it's limited to an audience who probably isn't very representative of general readers. This is great data on mobilread users - not sure it tells us a lot about everyone else. Only a small fraction of readers hang out in online spaces related to books (I think the last survey I saw said 8%). The other 92% need an offline or in-store (including online store) method for discovery, and I think in-store visibility matters a whole lot for that group of readers. Bob has some good points on this and I also have to wonder, since this sample was taken online, if the results are reflecting that. But this is wonderful information to have and many thanks to Mark for compiling and posting it. Fits right in with what my research has led me to believe. The trick is, integrating yourself with forums (enough that you aren't considered a "feed hacker"), while still finding time to write. Thanks for sharing this! I'm a random person, too, so I can appreciate those methods the most. Thank you for this info! It just goes to show that we must continue to spend the greater amount of time marketing online for the best results. Great post, Mark. I am a new kid to this block but consider me duly impressed. It just goes to show...there are always surprises just when you think you know all the answers. The quest for targeting readers never ends. Good info - thanks much! The key is finding those online forums and interacting without ruffling feathers. Sometimes people forget writers are readers as well and we're not always marketing. I've had my hand slapped enough to be very wary of boards and forums. Thanks for such a concise survey. This is a great survey, thank you for this. 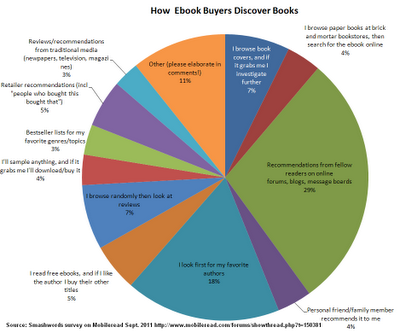 With the declining number of bookstores and more and more people buying eBooks and buying online, I've been wondering how people decide what to buy and read. Glad to hear all the work I'm doing at BookBanter is not for nothing! I'm confused about why you'd think that being on the best sellers list is how books get discovered, isn't it more likely that books that are selling well enough to get on those lists are being enjoyed by people who will tell their friends or post reviews or mention the book online? The lists are just a side issue, if a book is selling well it will get good word of mouth (or keyboard) publicity. Right? @Thacher ..Another good place that I don't see mentioned is Facebook. There is a ton of cross pollination going on there. Fans of any given author are always offering up recommendations on the fan pages and there are many pages dedicated to various genres. great post and discussion. One rec that you missed is by publisher--I think lots of epub romance readers buy first from their favorite online publisher, because they know they'll get a certain tone, and level of quality. Then, they will follow certain authors to other publishers. "Recommendations from fellow readers on online message forums, blogs and message boards..."
The survey was done on Mobilereads, which is an ebook forum. That might be skewing this bit of data. Great information and really interesting data. Ultimately it is all about readers and writers connecting. Reading is inherently an individual pursuit but the world of literature is and always will be a social community. Awesome post! More evidence that family and friends tell you what you want to hear and are not the best salespeople. I think, at one time or another, I have used every one of those methods to find something to read. Interesting information. Thanks, Mark! Great info! Word-of-mouth has been very good to me, although it's becoming harder and harder to be noticed in the growing sea of self-published titles. Thank you for the info Mark! I wish Smashwords had a marketing package for authors to save time on trial and error marketing efforts.